I’ve had my Pebble Time Steel for a little over a month now and if you weren’t able to tell from the glowing review I gave it, I’m more than pleased with my decision to become an early adopter. Since that review, my Pebble Time Steel has become an integral device for my productivity. And I’m not just using superfluous bloggy talk here; I really mean it. However, now that I’ve had my Pebble Time Steel for a few weeks, I’ve realized there are a few ways to make it a little more efficient, especially when it comes to incorporating it with my iPhone. Like getting rid of double-notifications. Previously, both my Pebble and my iPhone were handling the very important job of serving me notifications when I wasn’t in the middle of actively using my iPhone. In other words, when sitting at my computer, receiving a notification meant my watch would vibrate on my wrist and my phone would wake from sleep mode, providing an audible alert or vibration. It got pretty annoying, and at the very least, it didn’t feel ‘smart’ like both devices are expected to be. Fortunately, I found a way to fix this inefficiency by relegating my iPhone to only serve me alerts when the screen is awake, which means the only way I know about activity on my iPhone when I’m not using it is by receiving an alert on my Pebble. Disable any sound or vibration alerts, and disable Show on Lock Screen for visual alerts. This will prevent your iPhone from making any noise or vibrating on every alert and it will prevent your phone from waking up to flash you a notification # . 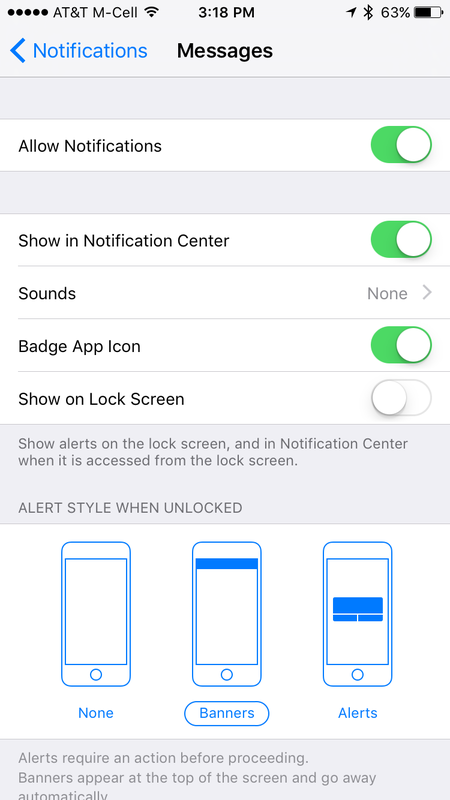 If your iPhone is unlocked, any notification you receive on your wrist will show up using the visual notification you’ve set for it (banner or alert), which provides a quick summary of what activity you let pile up while you were vetting alerts on your wrist to see if any were worth grabbing your phone to deal with. Well, nothing really, other then I’ve truly found the most useful function for any smart watch: the ability to allow me to stop pulling my phone out of my pocket every few minutes to see why it’s gently massaging my thigh for the 100th time that day. It also means that while I’m holding my iPhone, notifications will only appear as banners and not annoying chimes and vibrations, which is unnecessary when I’m staring directly at it # . Smart devices may be future, but they have a long way to go before they are truly smart and aware of the context in which they are being used, so until then, you’re going to have teach them how to serve your needs and be a value to you. Think of the Pebble Time Steel like a monkey butler, just one you can wear on your wrist.